If you are a collector of Canadian coins and looking for a standard reference, there is nothing better than The Charlton Standard Catalogue of Canadian Coins. Available in two volumes, the Charlton catalogs would be the Canadian equivalent of the Red Book Professional Edition. 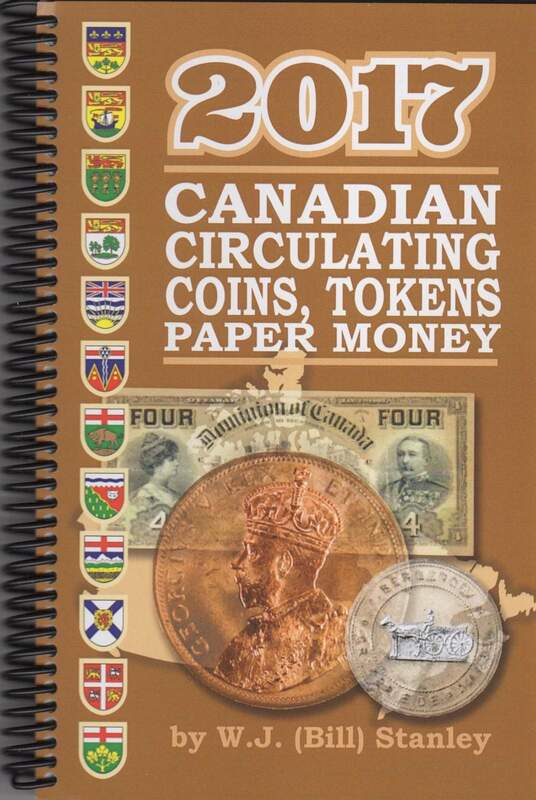 Charlton Press also publishes books for the Canadian currency and token collectors. All of the Charlton books are very comprehensive on their respective topic and a must for the Canadian collector. Like the Professional Edition of the Red Book, the Charlton Catalog is not a quick or portable reference. When I am searching through coins at shows or if I am just trying to identify something I had just acquired, I want a quicker reference with some basic prices that does not require me to hunt around the other information I am not interested in at the moment. I think I found the perfect reference for Canadian numismatics. While searching one of my favorite online coin supply retailers, I came across the 2017 by W.J. (Bill) Stanley. It is published by Canadian Wholesale Supply of Paris, Ontario. Within the book, it does not carry a copyright date and it does not have an International Standard Book Number (ISBN). It can be found at a number of online numismatic stores but not on stores like Amazon that require an ISBN. But if you are collecting Canadian Coins, Breton Tokens, or Canadian Paper money you should have a copy of this book sitting next to your Charlton Standard Catalog. While the Charlton books are very complete with a lot of information, the pictures are in black and white. All of the coin images in the Stanley book are in color. Although you can guess what the colors are, seeing the color images on varieties and being able to compare them with coins is of great help. Another advantage of the Stanley book is that it consists only of circulating coinage. Although the Royal Canadian Mint has expanded its catalog of non-circulating legal tender coins over the last decade, if you are just collecting circulating issues, then the other stuff is clutter. It is just the basics of what was circulated in Canada. This book is divided into three section. The first are circulating Canadian coins, the second for Canadian currency, and final are the tokens. The coin and currency section has a single introduction, guide to reading the tables, and an index to find the particular type you might try to find. The coin section has their pages numbered beginning with page 1 with the introductory parts numbered with Roman numerals. But the currency section begins on page B-1 following page 54 of the coins. The tokens section appears as if it was a separate book bound with the coin and currency section to make one book. It has a title page followed by a similar introduction, guide to reading the information, and an index. The introductory pages are not numbered but the token listings begin on page T-1. If the book was bigger, these page numbering anomalies would be confusing. I only noticed this when I tried to figure out how many pages are in the book. Considering that not every page is numbered and there are some blank pages in the middle, I think there are 132 pages in total. Not very thick and spiral bound for easier handling. Prices in the book are given for the basic grades and includes prices for significant auctions and prices gathered for rare and significant coins. As most of us are aware, most printed price books are obsolete by the time they are published. What Stanley does is use information he gathers from auctions and coin shows around Canada to determine the prices. In his introduction, Stanley admits he uses his judgment to exclude what appears to be bogus data based on bidding wars or data from untrustworthy sources. He also admits that there may be errors. Without reaching out to Stanley, it appears he is the sole responsible person for the prices and content of this guide. Maybe that is a good thing considering the inaccuracy of similar guides from other publishers. However, after go through his guide and a number of other sources including the prices from a few Canadian dealers, this book may be more accurate than his caveat suggests. After that, it is pages of coin listings similar to any price guide you may find. The number of coins minted is included on each line. There are images of coins, images of varieties with an arrow point to subtle differences, and prices in the most relevant grades of circulating coins. I cannot speak about the Charlton Standard Catalog of Canadian Currency since I do not own that book, but similar to the coins’ section, the Canadian currency section is nothing but the basics. Color images are reproduced from the Bank of Canada and have “SPECIMEN” superimposed on each note. Descriptions note signature, portrait, and serial number differences (i.e., prefix types) for the notes and the prices in the most relevant grades. Tokens are a very important part of the history of Canadian money. When coins or currency was not available, Canadian towns and provinces created tokens to act in the place of money. The history of Canadian tokens is fascinating and worth another report. It is important to note that the cataloging of tokens is based on the work Pierre Napoleon Breton in his book Illustrated History of Coins and Tokens Related to Canada originally published in 1894, since republished and updated. As part of his cataloging of tokens, he assigned them a number that is now known as Breton Numbers. Stanley lists Canadian tokens by Breton Numbers. Although I am not a collector of Breton Tokens, I am fascinated by other areas of numismatics especially if they are different. What thrills me about this section is that the tokens are imaged side-by-side with their basic information and prices. It is not a tome on their history but if I was a collector, it would help me identify these tokens and what I might expect to pay for them. I found myself flipping through the pages looking at the tokens, what they say, and thinking about their possible history. I want to go back through my back issues of The CN Journal (publication of the Royal Canadian Numismatic Association) and find some of those stories about tokens I never read. Flipping the pages of such as basic reference, I never thought I would learn so much. I think it is because all of the other information has been omitted, I can see the coins, images of the varieties, and the prices without distraction. Now that I have learned a number of things, I can pick up other references to learn more. My only minor nit about this book is the page numbering scheme and the lack of coherent index or table of contents. I give it a grade of MS-68 for being a simple reference of circulating Canadian numismatics and a book that I recommend. Information in the images is copyright of Bill Stanley and used on Fair Use. Page images are licensed under Creative Commons Attribution-NonCommercial-ShareAlike 4.0 International License.